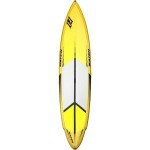 The Naish Glide GS SUP is a great choice for riders looking for stability for touring or ocean runs and races alike. It’s no secret that we’re big fans of Naish SUP boards and products. All of their boards are built with cutting edge construction and materials technology, and designed with features for riders of all abilities. Overall, it’s a high performance brand. But the versatility is what we like best. The Naish Glide Touring GS 12′ is the perfect board for those looking to combine all around (beginner to intermediate) features with a true touring and exploration platform. This board features a wider design than the Glide GS – for added stability. This board has a nice displacement bow to plane and cut through chop. It’s also designed with a double concave bottom in the nose and V in the tail for added directional stability. The Glide Touring GS allows novice and recreational riders to experience the benefits of true racing and touring design features. The 12′ version holds riders up to 230 lbs and is the ultimate fitness and adventure machine for most flatwater and surf conditions. is this better than the nalu board? It’s a completely different type of board. The Nalu is more of an allrounder that can be used to surf some waves. The Glide is more of a touring/racing board. You can’t really say one is better than the other. It really depends what you want to use the board for. Is this a review of the old model? The picture doesn’t look like the new one. Yes, it is a review of the 2015 model. I did not get a chance to review the 2016 one yet. can you do a comparison of the new one and the old one? did anything change except the color? I just bought the new one, the board is great but the design still looks crappy. Can you do a review on the new one too? thanks!